If you frequently experience aches and pains that cause you extreme discomfort throughout your day, you are not alone. 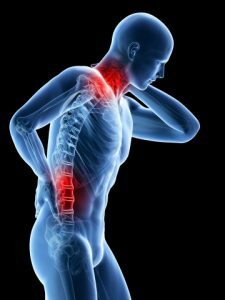 In fact, many people suffer through chronic pain without taking action and remedying the source of their pain. However, there are many ways that visiting a chiropractor can help to reduce your overall level of pain in order for you to live a more enjoyable life. That’s why, in today’s article, we will be discussing some of the main reasons why you should consider visiting a chiropractor. Chironow Loveland is staffed by a team of friendly professionals that are devoted to improving the health and wellbeing of our clients. We know that no two patients are the same, which is why we implement patient-specific treatment plans using the leading chiropractic techniques based on the needs of each individual. Best of all, we welcome walk-ins and never require that you schedule a chiropractic appointment beforehand. To learn about some of the main reasons why you should visit Chironow Loveland, Northern Colorado’s top chiropractic office, continue reading more below. Feel free to contact us with any of your additional questions. Here’s why you should consider seeing a chiropractor in Loveland. Too often is an individual’s mood compromised while enduring chronic pain throughout the day. We have all experienced a debilitating headache and the mood-altering effects that comes with a relentless migraine. Chronic pain can also play a large role in one’s mood and can cause individuals to have difficulty concentrating, due to the distraction of lingering pain. Constant aches and pains can cause an undue amount of tightness, increasing your stress levels and elevating your cortisol levels. However, by visiting a qualified and experienced chiropractor, you can do much to alleviate low back pain, neck pain, tightness in the shoulders, and any other ailments that you may be experiencing. Ensuring that your spine is in proper alignment can significantly improve your quality of sleep, leading to a more productive and fulfilling day upon waking. There is a direct correlation between chronic pain and quality of sleep, and aligning the spine through slight spinal adjustments can alleviate the negative effects of improper blood flow throughout the body while reducing discomfort and increasing your level of relaxation. By properly addressing a misaligned spine, your chiropractor can help clear the neural pathways to your brain, allowing the body to function properly while working to restore your overall level of health. Pairing a properly aligned spine with a restful night of sleep can help your body recover significantly from chronic pain and discomfort. If you work behind a desk or have a job that requires you to sit for extended periods of time, you may experience extreme discomfort in the form of low back pain or neck pain. Long periods of sitting can cause individuals to develop horrible posture and can encourage slouching, unnatural spinal curvatures, forward head posture, and a variety of other undesirable side effects. With poor posture comes a compromised spine that can cause nerve pain, discomfort and a host of problems that can plague you for years to come, if not properly addressed. Fortunately, by visiting a chiropractic office staffed by a team of professionals, you can work to correct your poor posture over the course of multiple visits. By practicing proper posture, you will be able to naturally strengthen your back, allowing you to stand upright with little to no pain. One of the many benefits that individuals report after correcting their posture is an almost immediate boost in self-confidence, one of the numerous perks that you can experience by visiting Chironow Loveland. While these are just three ways that you can experience relief by visiting a chiropractic office, the health benefits of maintaining proper spinal alignment are truly endless. With less pain comes a higher quality of life, which is why Chironow Loveland is here to help you get back on the road to recovery. If you are located in Loveland or the surrounding areas of Northern Colorado and are looking for the highest-rated chiropractic office near you, consider visiting our friendly office today at Chironow Loveland. From conventional spinal adjustments to RockTape applications for reducing inflammation and pain, we offer the leading services designed to help you live a pain-free life. Visit our website or contact us today to learn more. We look forward to speaking with you!